I’m feeling sad. After 26 years and 17 printings, our book “In Quest of the Mythical Mate” will no longer be available in hard cover. I’ll miss her. She really is like an old dear friend, symbolic as the first big collaborative project Pete and I did together. I feel nostalgic about those birthing years. Pete and I walked, talked and worked together with creative energy and intense youthful enthusiasm to launch The Couples Institute and build our Developmental Model. Add to the mix writing the book about it. Then we juggled all that with the birth of our daughter, Molly, and the exciting first year of her life. We wrote the first two thirds in the year before she was born and the last third wasn’t finished until after she was a year old. It has been a long time since I’ve written a blog specifically about The Developmental Model of Couples Therapy. It seems timely to summarize some aspects of our model that have truly stood the test of time. Becoming an effective couples therapist is no easier now than it was when we started. It still means being incisive, decisive and quick to interrupt chronic negative cycles. It means being highly active without getting in the way of each partner stretching to develop new parts of himself or herself. It takes you managing your own reactivity and smiling while you make tough confrontations. Central to our model is the belief that couples relationships require energy, vitality and developmental growth from each partner. Too many partners try to maintain stability by demanding compliance and insisting on unnecessary sacrifice from one another. These relationships die as partners stagnate in conflict avoiding or conflict dominated relationships. Growth in the present is sacrificed in hopes of recreating the unconditional love they so badly needed when they were young. Within this framework, and with my online couples therapy training program, you can provide a clear roadmap of what good healthy development looks like and you can clearly explain how couples trigger one another, how they inhibit development and why they become chronically symptomatic. Yet, it is not a pathology model. Understanding the Developmental Model allows you to work actively with partners to create differentiation-based moments in the office, while helping them embrace anxiety leading to growth. Couples who are stuck are unable to do that. They misinterpret differentiation and attack each other when differences surface. When they have very different desires, they think there is something drastically wrong. Sadly, they miss some of the most challenging growth possibilities as part of their journey to deeper love and vitality. Pete and I define differentiation as the active, ongoing process of being open, vulnerable and authentic. This means each partner takes an active role in defining self in real time, expressing his or her thoughts, feelings, wishes and desires. This means managing existential anxiety that comes when there is disagreement and partners don’t want the same thing. In these moments there is an opportunity for greater intimacy and a risk of greater disappointment, but they are committed to activating themselves, being open, revealing themselves and managing ambiguity. And no – couples won’t go there without your strong hand, leading, encouraging, supporting and confronting. This is the true joy of being a couples therapist! The publisher is selling the new soft cover “In Quest of the Mythical Mate” for $48.95, but we’re pricing it at $42. If you would like to check it out, claim your copy now. Many therapists keep a copy in their offices to use the chart in the appendix. It includes a description of each stage including the unique developmental tasks of that stage and the developmental stalemate. Then it describes how to assess the stage and provides specific treatment suggestions for each stage. A very handy reference, indeed! I am deeply touched by your comments. I still remain highly committed to doing more for couples and the therapists who are challenging themselves to change lives and make a difference! I’m also sad to see that book go. 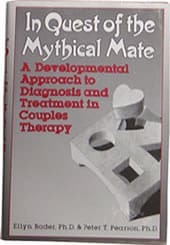 I was trained with Pete and Ellen over 15 years ago, moved out of the Bay Area to Atlanta, and have been successfully using the Developmental Model to couples therapy since then. I use it daily in my own life, with spouse, kids, colleagues, friends, and strangers. To manage my own reactivity was a priceless lesson I learned from them. It sounded so foreign when I first heard it, but the more I used it, the less stressed out I got, and that made me stick to it. I teach my clients to, as Pete often said, “not rattle at the presence of somebody else who was rattling.” I loved Pete’s analogy of the tuning forks, and still use that with my clients. I can see the puzzled look in their faces when I introduce that concept and pull out my “I to I” handout, but once they get it, a new relationship is born. Thank you Pete and Ellen, for changing lives with your developmental model, mine included. I am half-way through the book and it has already helped clarify so much and is already useful to my practice. I keep it on me. curiosity and compassion. I truly think of you every day as I work and remember of some words you said in training or draw on a concept I’ve incorporated from your teaching and I can see in front of my eyes how deeply it is helping the work move forward. Also, 5 years ago my dear husband of 18 years came out. We used every concept and skill that you teach to help ourselves through a year of vulnerable open, deep, honest communication and healing before we officially ended our marriage and have remained the closest of friends. We are now about to reopen our professional practice in a new location after not having worked together in the last two years. I thank you every day for your part in the healing of me and of the healing of my marriage and the strength it gave me to keep going deeper with my courageous couples. And PS I still have my old worn yellow paged copy of In Quest of the Mythical Mate very close by. Your book has ben important in my work and I use the concepts daily. In fact, a copy is on my desk now. Well done and thank you. So glad you wrote this book! A foundational book I read just starting out with couples 20 years ago, and a book I still refer back to, especially with more difficult couples. I’m glad I have a copy in my library of favorites. Is this a new edition? I.E. Has the book been updated? Quest has certainly stood the test of time! A testament to both it’s relevance and its usefulness. I still have my first edition sitting right here in the middle of all my brain books! Dear Ellyn, I honour your sadness, and thank you and Pete for your amazing contribution through your work to the world. I’ve been meaning to order the book since I started the program so thanks for the opportunity to do so today. I love the structure the model gives to offer hope in supporting the growth of relationships. One word: WOW. What a great recap of the model. Ellyn and Pete are rock stars in our feild and their commitment to improving couples therapy is a huge gift. I have benefitted immeasurably!! !